In 1925, the Lakewood Products Co. of Cleveland, Ohio, patented the cute and interactive "Mov-I-Graff" toy pictured here—a postcard-sized piece of cardboard featuring "The Man of a Thousand Faces" in profile. When you gently wiggle or "vibrate" the postcard, a thin chain making up his nose and chin area moves back and forth to create ever new profiles. As an ad for the product in the January 9, 1943, Billboard magazine explained, "It's the Mov-I-Graff Cartoon Greeting Card built around a figure of a person. However, instead of a drawn face, a small chain is attached from the forehead to the neck. By holding the card in one hand and tapping it lightly with the other, the face of the character takes various and odd shapes." If you're dying to see The Man of a Thousand Faces in action, skip ahead to the video at the end of this posting. It appears that the rights to the Mov-I-Graff were eventually purchased around 1943 by the Weinman Brothers (the Billboard ad quoted above announces the addition to its product line), which was perhaps the same Weinman Brothers that was founded in 1912 and launched a jewelry collection in partnership with Lauren Bacall in 2007. Whether or not the length of chain that makes up the Man of a Thousand Face's profile evolved into a necklace endorsed by Bacall, it is clear the object had commercial appeal. As the version of the toy pictured here indicates, it became a premium give-away advertising item—a sort of business card used by O.A. 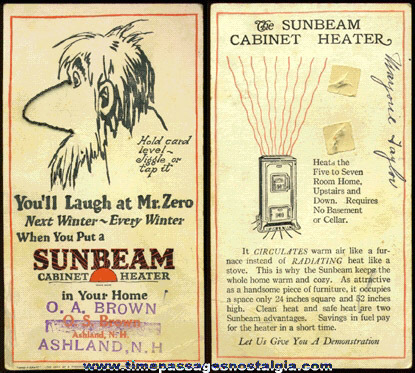 Brown of New Hampshire to promote his business installing Sunbeam Cabinet Heaters. Other companies took a page out of Brown's playbook. Kingan Meats of Indianapolis used the Mov-I-Graff to advertise its "reliable" hams and bacon. Marion Power Shovel Company of Marion, Ohio, dug its own niche in the market the same way. And Goodyear advertised a lawn hose and golf balls via the Man with the Thousand Faces as well. 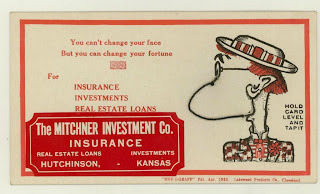 As the Mitchner Investment Company's use of the Mov-I-Graff (pictured above) suggests, companies asking potential customers to shift brand loyalties no doubt found an appealing and even instructional figure for the nature of that change in the shifting profile of El Hombre himself. "You can't change your face," Mitchner's card reads, "But you can change your fortune." Unless it is my changing phiz. I even bob my lovely hair. Certainly, this version of the card works to discredit the New Man of the 1920s, casting him as effeminate, queer, clueless, and—as the chain forming his profile perhaps dramatizes—delicate, droopy and unreliable; he's a man of a thousand faces, not a model of masculine consistency exemplified by what in the 1950s would become his cultural opposite, the Marlboro Man, who also wears a hat and shirt with collar, who we also frequently see in profile, and whose high cheekbones seem to preclude any fashionable or girly changing of his phiz. The interns at the P&PC office are quite taken with that word—phiz—and not just because they discovered it for the first time two or three months ago on the back of a photo from the nineteenth century's Jersey Shore. 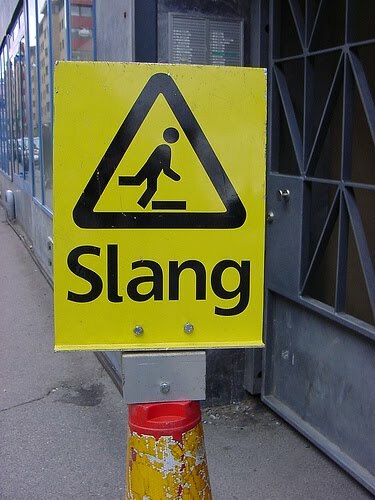 In the present context, they've pointed out, phiz combines with other colloquial words such as duds and bob to create a neat little record of 1920s slang. (Note: according to the Oxford English Dictionary, the word bob was first applied to women's haircuts in 1918 when Punch noted the "alarming speed of bobbing.") Reading the card today, they're not only struck by how language changes (where, oh where, has phiz gone? ), but also how, in this context, the Mov-I-Graff discredits popular linguistic innovation—and thus the changing nature of language more broadly—by associating it with the effeminate, dandy-esque Man of a Thousand Faces. That is, like the chain that forms his phiz, the language he uses is fluid, changing, dynamic, queer, effeminate, and probably, by extension, downright un-American. 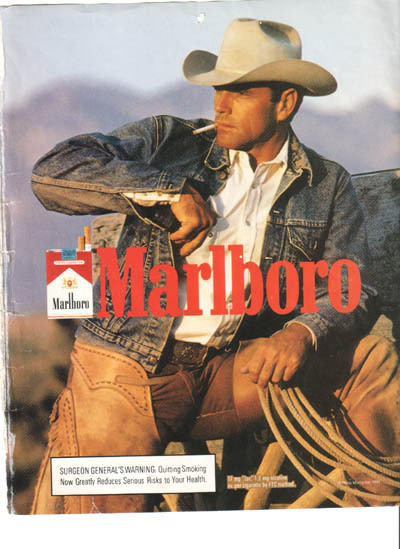 The Marlboro Man—repository of constant manliness, firmness, tradition, and a man of few words—would never be caught talking like that! We think our interns are onto something, don't you? 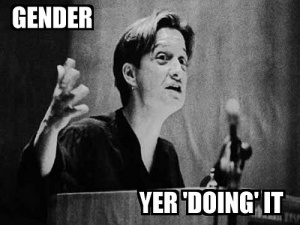 While change in one sphere of people's activity—switching from one brand to another brand in the consumer marketplace—is encouraged, changing the way we speak and thus challenging the authority of established language practices (see English-only debates, for example, or the history of gender-inclusive language) is not. In fact, in the context of this poem, the etymologies of both bob and duds suggest as much. Originally from the Old French and Middle English, bob has also been used to mean "to befool, mock, deceive" and "to cheat." Similarly, dud (of unknown origin) has been used to describe "a counterfeit thing applied to any useless or inefficient person or thing." In the very fabric of its poem, then, this Mov-I-Graff postcard indicts the Man of a Thousand Faces as a fool, a cheat, and a counterfeit; his character reveals itself not just in what he wears, but in the very slanguage he speaks. 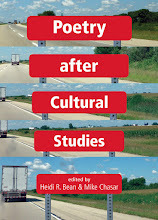 But that's how the "they" of the poem—a they that represents itself as the voice of common sense, convention, and social norms—wants us to view Mr. Man. We here at P&PC want to view him more sympathetically. In his bob, his duds, and his changing phiz, the Man of a Thousand Faces is not himself a fool (except in the Shakespearean sense, perhaps) but is in fact mocking, fooling, cheating, deceiving, unsettling and revealing as counterfeit mainstream values of standard language use and gender identity; indeed, insofar as it is nearly impossible for him to have the same face twice, he disrupts what Judith Butler would call the interability of gender identity—that "regularized and constrained repetition of norms" on which normative gender identities depend. 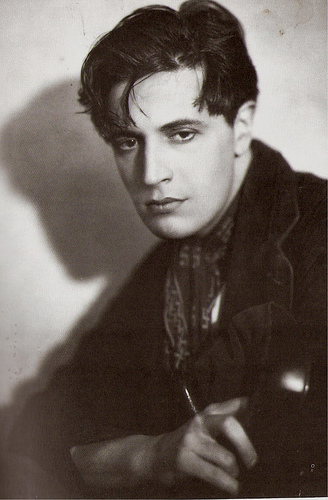 In his "lovely" bobbed hair and blushing phiz, then, the Man of a Thousand Faces may well be one of the first drag queens of American poetry. Is it possible, then, that his popularity in the mid-twentieth century tells us more about the American public's desire than first meets the eye?